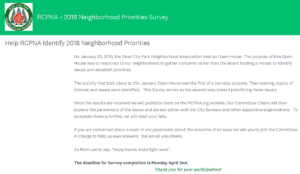 Please take a few moments to complete the following Rose City Park Neighborhood Association(RCPNA) 2018 Survey on Neighborhood Priorities. The RCPNA Board will be using these results to help guide us in our priorities for the remainder of this calendar year. Your insights are important to us as our community continues to change and grow. Thank you for your time and assistance. Deadline for participation is Monday, April 2nd.